Pagham joint boss Tom Simmonds admits that the club’s poor winter form has cost the club a shot at promotion – but believes that the Lions can still end the season on a positive note. 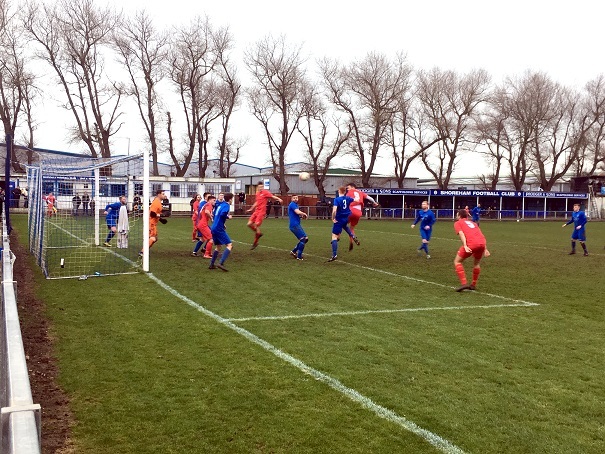 Any hopes of the Nyetimber Lane side gaining promotion from SCFL Premier have been ended after a run of just one win in 11 in all competitions. That poor form continued in the last week with a 0-0 draw at Shoreham followed by a 2-0 reverse at home to Crawley Down Gatwick in midweek. With Pagham now ninth, 19 points off the top two, Simmonds said he and fellow manager Richie Hellen wanted to use the rest of the season to rebuild. He said: “The league has gone but we still have a cup quarter final and we will start to look ahead to next season. For Simmonds, who only took up his first senior job in football last season alongside Hellen, it is a new and unwelcome experience. He said: “Things are tough at the moment and after matches we’re all thinking about what more we can do to get the results we want. We went into the first week of December four points off the top and we had only lost once all season. Pagham’s plight has not been helped as a number of those injured players have now moved on to pastures new. Callum Overton (Lewes), George Gaskin (Three Bridges) and Shane Brazil (Wick) are now signed up elsewhere. With Ryan Cox now abroad and striker Dan Simmonds missing for another three weeks due to a hamstring injury, Pagham’s selection issues are unlikely to be solved any time soon. Next up is a home match against struggling Loxwood tomorrow (3pm). Simmonds said: “Before Tuesday we had only lost the same number as the league leaders. If we had been offered that at the start of season we would have taken it. “We have got one of the best defences in the league, it’s just about finishing things off and being more clinical.